Tara!!! No, wrong one, drat. Though seemingly sweet and innocent, Tara Markov proves to be incredibly secretive and manipulative once she infiltrates The New Teen Titans as a spy for Deathstroke. I've never read Teen Titans, or New Teen Titans, or any other incarnation of them - I'm slow to warm to team books anyway, and having "teen" in the title just makes it sound silly to begin with. 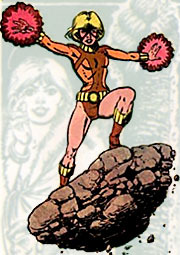 Nor do I know anything much about Terra, aside from the appearance of a successor to the name in a Supergirl issue where, predictably, this new Terra was a better superhero than Kara was. No surprise, Kara's a disaster. So this figure doesn't have any particular attraction for me - and yet I bought two of her, at her standard price. Why? Read on. In terms of sculpt and articulation she's a bit of an oddity for DC Direct. Normally they make their figures to just sort of stand around in a neutral kind of way, looking statuesque but not really doing anything much; Terra is made to duplicate a specific piece of art, in which she's posed, well, as you see here - one leg bent to balance on a sloping bit of rock, arms outstretched to make it fly (or something), and in the art, at least, with energy radiating from her hands. By the standards of DC Direct figures she takes to the pose fairly well - these things are never very articulated, but her hip and knee joints, along with the inclusion of swivels at the boot tops, make it fairly easy to get her almost looking right. She'll never quite make it all the way - there's just something a bit forced about the tilt the hip joint gives her leg - but combined with two pegs on the base, one for each foot, she stands relatively well. Legs aside, she's got a balljoint neck, balljoint shoulders, and swivel wrists. No elbows, which is a bit irritating - she doesn't need them for her designated pose, but it makes it really difficult for her to look good in any other pose, and honestly, she doesn't look to great in this one either. The lack of the energy coming from her hands makes her arms look like she's just awkwardly waving them about, and elbow joints would have offered a little bit of fine-tuning in that regard that could have helped. Paintwise she's pretty good, with no obvious mistakes or missteps. The yellow and brown colour scheme, though, doesn't quite work the way I think it's meant to - in comic art of the time these colours were just fine, since the palette was limited across the board, but taking those colours off the page and applying them to a figure, then putting her alongside other figures with more modern colouring, makes her look kind of like the interior of a 1970s car, all brown velour. The gold detailing on her collar, belt, vambraces and boot tops doesn't help much - although the yellow has a bit of orange in it, the two colours are still way too close to work together. The costume isn't exactly the colours that it was on the comic pages, but I think it may have been a wise choice to reinterpret the colours a little more boldly. So far as accessories go, DC Direct really didn't have the option of not including her chunk of rock, though it's grey rather than brown, which works against the lumpen, Earthy sculpt a bit. As I said it's got two peg holes, one for each foot - different sized pegs, so you have to have her left leg forward, and can't swap her around for variety. I can't imagine why companies do that kind of thing,unless it's just sheer bloody-mindedness - would it really be terrible to give a collector the option of changing her stance a bit? 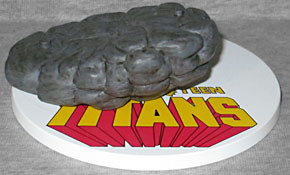 The rock makes for a very stable base, but since everyone in the New Teen Titans line has a white circular base to stand on, so does Terra - the rock has a peg hole in the bottom, allowing it to sit on the round base. This is entirely redundant, and quite silly-looking to boot, so I don't doubt that many a circular base is going to wind up discarded in a drawer, or incongruously supporting other non-Titans figures who just won't stand up on their own - although they'll need to have larger peg holes than Terra, since she can't use it. More bloody-minded design there. So she's a figure of Terra, good enough if you really want a Terra figure, but hampered by various irritations that keep her from being appealing on broader terms. So why did I buy two of her? Well, the first one was just because I collect action figures - for the second, though, look at her figure, teenage-girlish, the hands with a hint of claw-shape to them, the costume with no stand-out sculpted elements anywhere but the boot tops, wrists, and belt, the short bob haircut, the open mouth with the prominent front teeth... aside from the sculpted mask, which is very shallow, she's ideal material for a Squirrel Girl customisation, and I love Squirrel Girl. It'll need some delicate application of furred fabric to her torso and gloves/boots, the manufacturing of a tail, and all-over repainting - I should be okay on that score, I used to paint Warhammer 40,000 armies - but she really is the perfect basis for a custom. 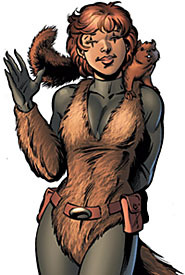 So there you have it - DC Direct made a so-so DC character, but the basis for an excellent Marvel one.